Aren’t they great? I love the yarn and the pattern so much. The only problem is that knitting these small twisted stitches really hurts my hands. I can only knit them for 30 minutes at a time and then I have to put them down. The result is worth the effort. I’m going to put this sock on spare needles and cast on the second sock using the other end of the skein (starting from the center of the cake). Why? Well, mainly because that’s the way the KAL is organized – knit both of the socks at the same time. And it also gives my hands a break from the twists and turns and allows me to just knit simple stockinette stitch for a while. And if you thought that was enough orange in the house, you’d be wrong! Look what arrived in the mail last week! 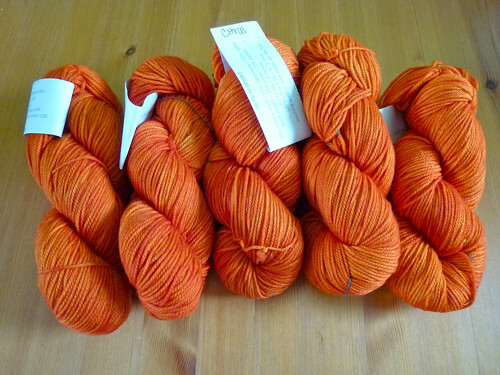 These are 80/10/10 sport weight from Madelinetosh, color Citrus. The color in the photo is a little flat. The skeins are even brighter. I know, I know, what am I doing buying yarn when I’ve been trying so hard to destash yarn? I couldn’t resist the orange. Period. The only other yarn I will allow myself in the next several months is a bright Spring green. If I see some of that I will buy it. Period. You’ve been warned. As for my other projects, I knit the collar on my Smocked Cable Coat, but I didn’t like it so I ripped it out and have to try something else. That’s my goal for the coming week. And the brioche afghan is off the needles!!!! YIPPEE! That thing took 6 100g skeins of DK weight yarn. It’s big and beautiful. I now need to weave in the ends and block it. The only way I can block it is to move some furniture and pull out a hide-a-bed and lay it out on that. Photos should be coming in another week! The sock looks great! 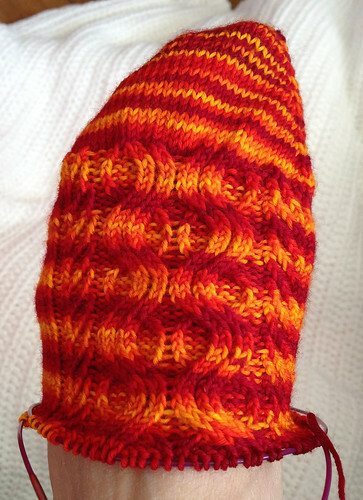 The pattern and yarn are a good match–the waves in the pattern look like flames.